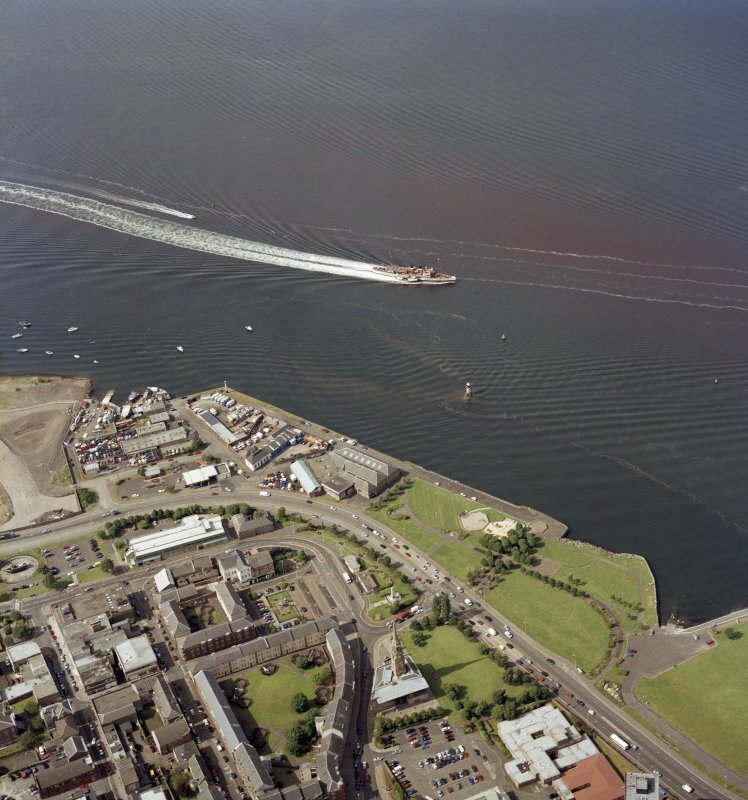 Oblique aerial view centred on the tolbooth and the quay with the Waverley Steamer passing by, taken from the S.
Oblique aerial view centred on the tolbooth and the quay, taken from the SW.
Aerial view of Town Buildings from North East showing relationship with site of harbour. Illustrated on page 175 of Tolbooths and Town-Houses. This is retained in digital format only. View of new extension from west. 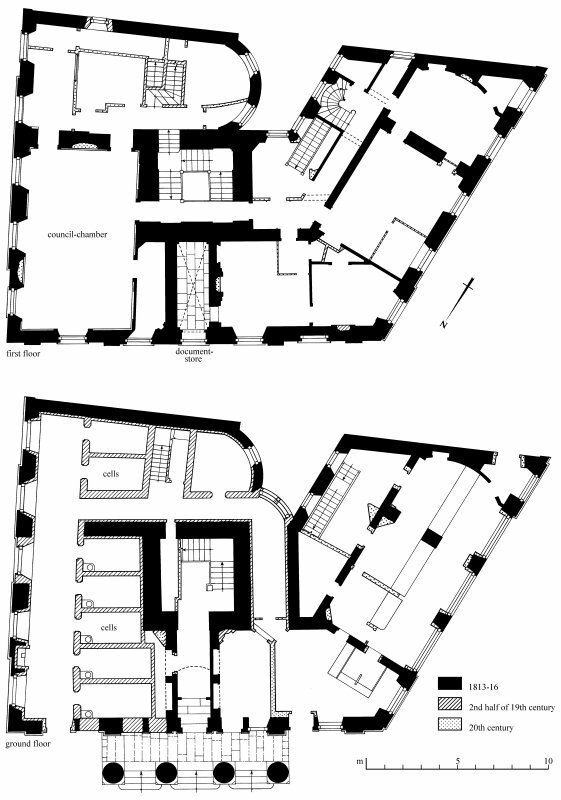 Survey drawings: Ground-floor plan; First-floor plan Preparatory drawing for 'Tolbooths and Town-Houses', RCAHMS, 1996. 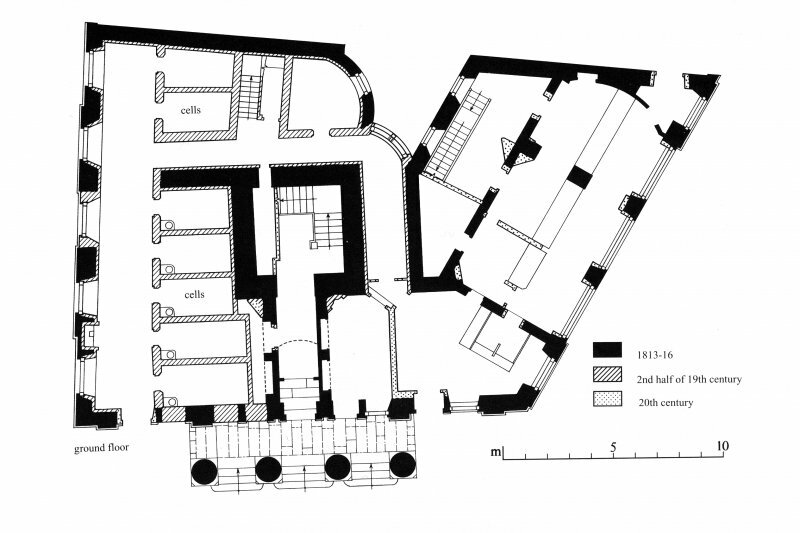 Floor plans Preparatory drawing for 'Tolbooths and Town-Houses', RCAHMS, 1996. 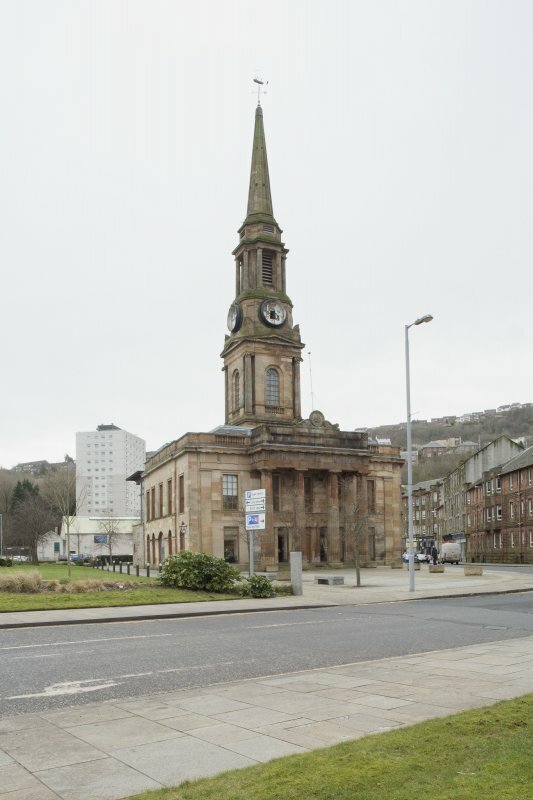 This distinguished building, whose steeple dominates the harbour area of the port, was designed by the Glasgow architect David Hamilton and built in 1813-16. 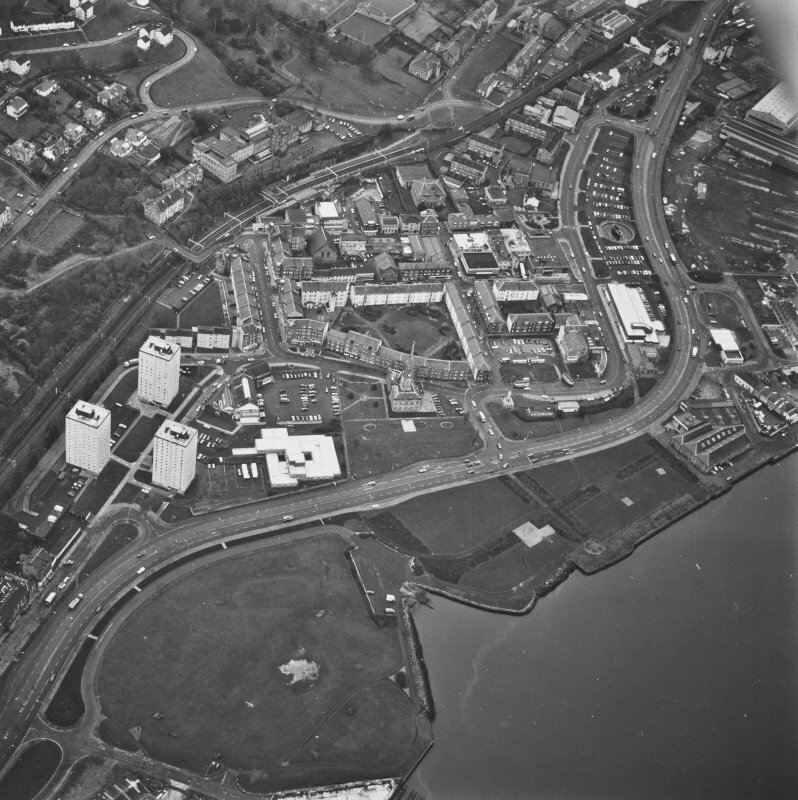 It is situated on the E side of Fore Street, at the core of the remaining, portion of the town's original grid-plan. 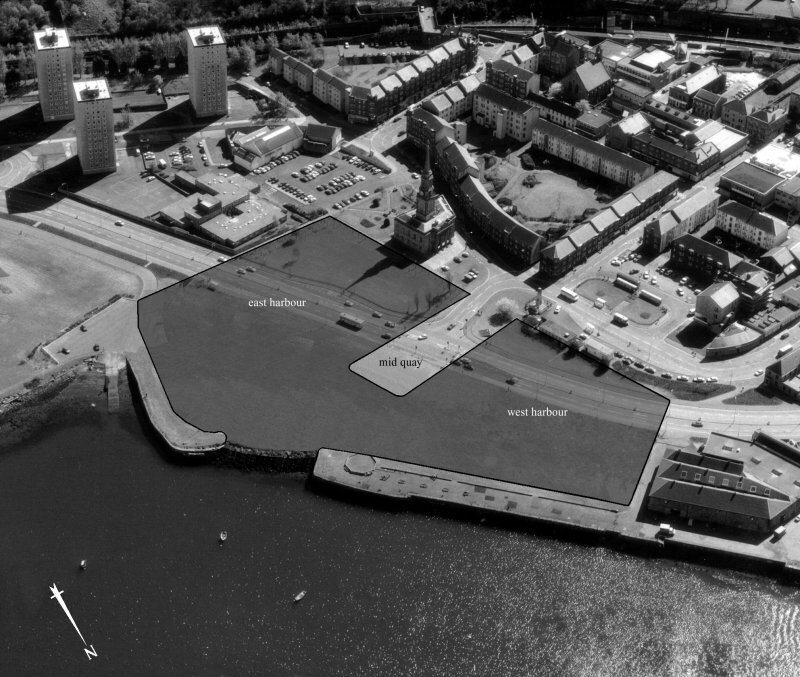 This position on the quayside of the principal harbour, which was infilled in 1961-2, reflected its importance in the mercantile life of the port. 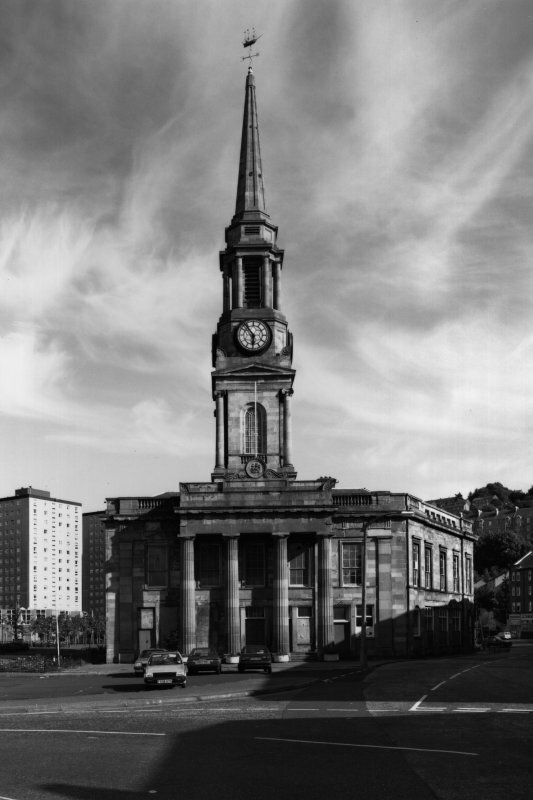 When built, it housed a 'Council Chamber, Justices ' Court House, Prison, Bridewell & other public accommodations'. From at least the middle of the 19th century, part of the ground floor contained shops and the first floor a reading-room and merchants' counting-offices. 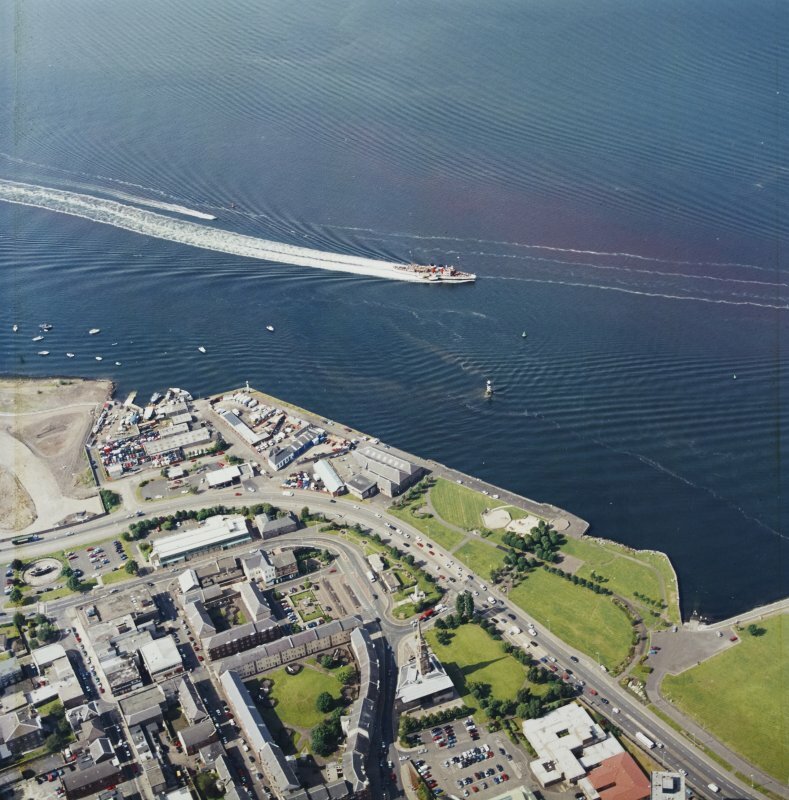 The building has undergone considerable later alteration and partial changes of use. The ground storey was refurbished in 1995-6 for library use. 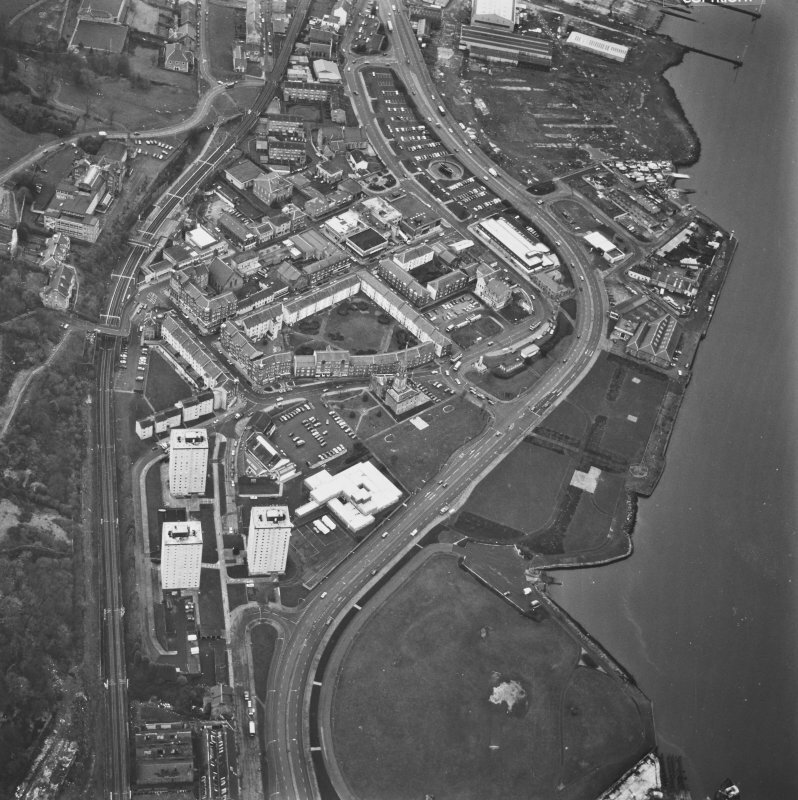 The building is irregular on plan, reflecting the availability of ground for its lay-out. 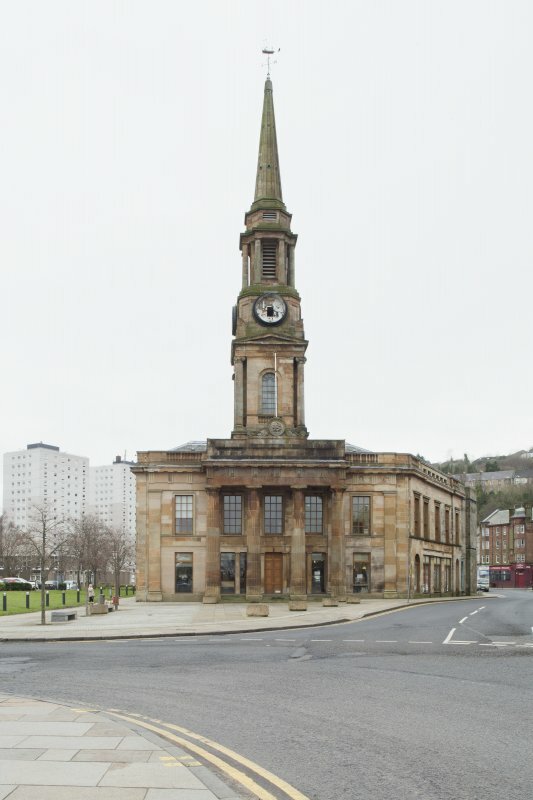 The main (N) front, which incorporates a massive portico, measures 21m in length, while the S front is divided into separate E and W blocks measuring 29m over all. 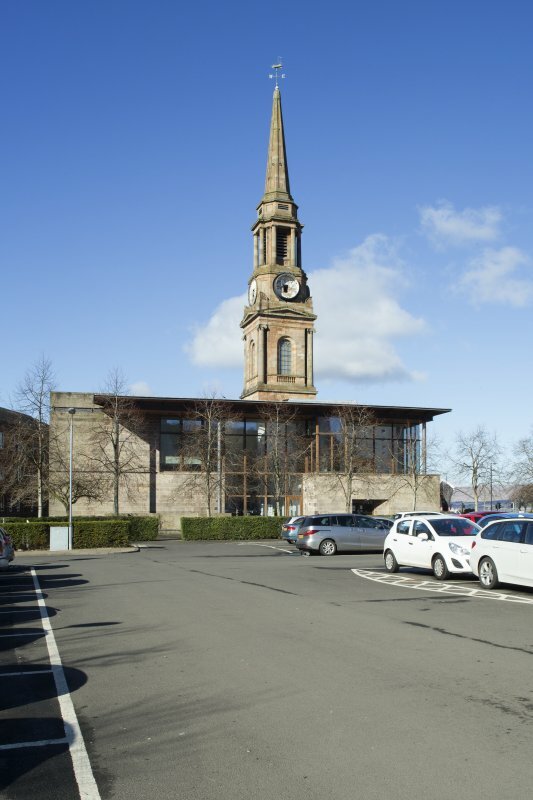 There are two principal storeys and the steeple, which rises from the centre of the building to a height of 47.6m, is of four main stages. With the exception of the S front, which is harled, the building is constructed offinelywrought ashlar which it was proposed to obtain from the Garscube quarry. The fenestration is largely regular with the exception of the S front. The main focus is the N front, whose Doric tetrastyle portico encloses the principal entrance and is surmounted by a massive entablature. 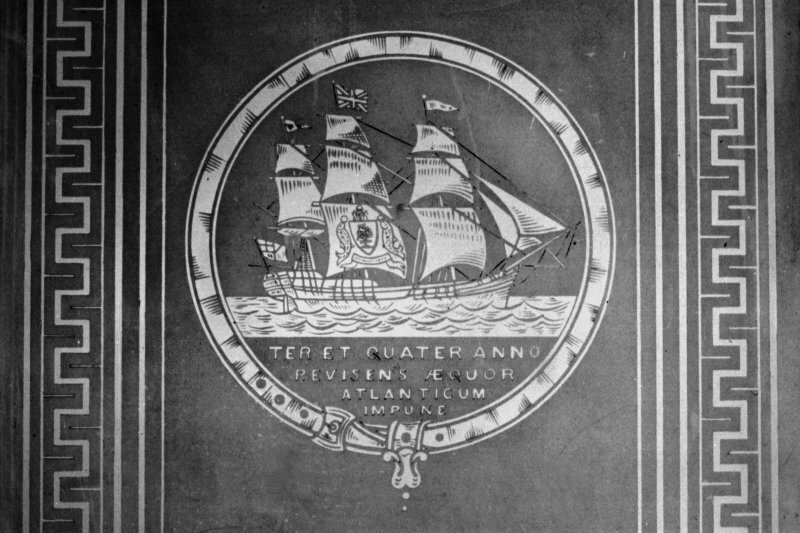 This supports a central roundel, flanked by bold volutes and carved with the burgh arms, a ship in full sail. At each angle of this front there are pilasters, and at the wall-head there is a parapet with an open-work balustrade. The round-headed ground-floor windows of the E front, linked by impost-bands, were probably converted from open arcading. The roof is of irregular hippe'd form. 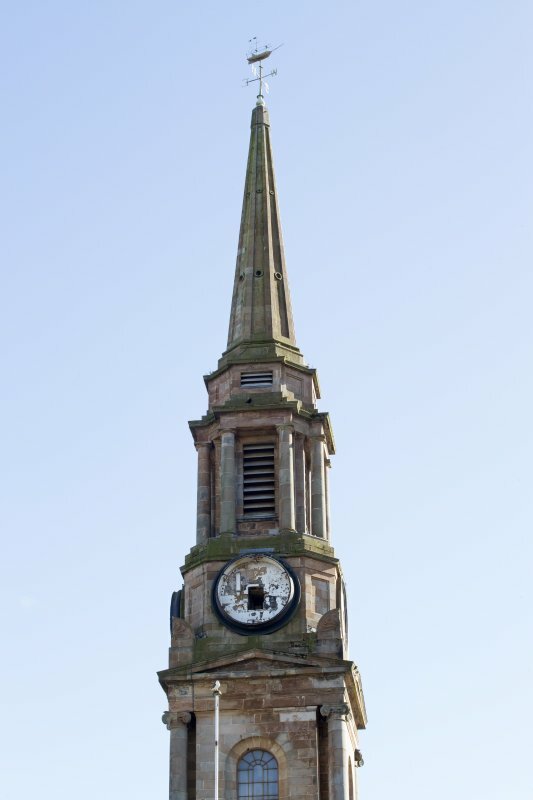 The steeple, which is very similar to that designed by Hamilton in 1812 for Falkirk (No.28), employs a range of classicising motifs. 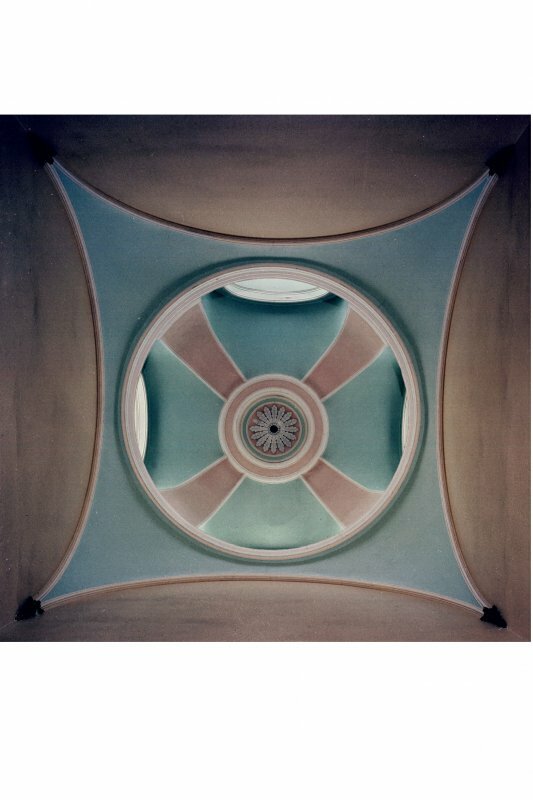 Above a plain base-course there is a pedimented stage framed by Ionic angle-columns which enclose recessed round-headed windows over blind balustrading. 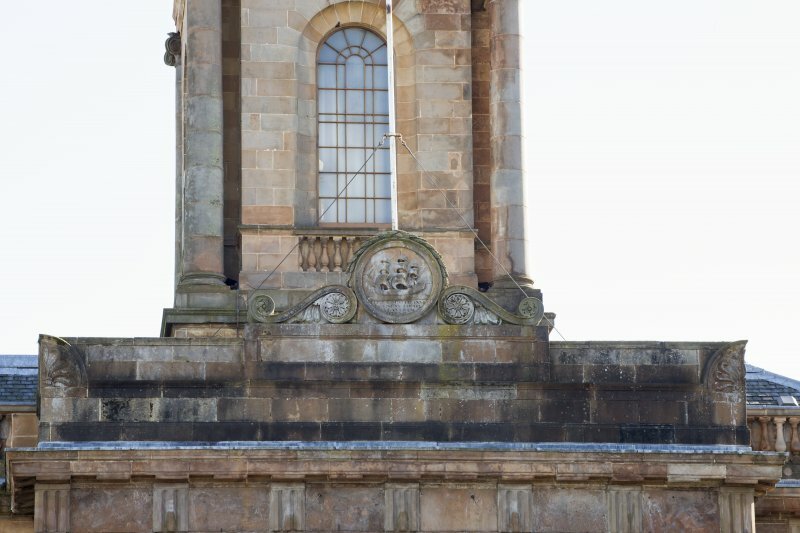 Above this the octagonal clock-stage displays circular clock-faces in the principal fronts and recessed panels in the subordinate faces, with anthemions at the angles. The belfry has rectangular louvred openings in the principal fronts flanked by Tuscan columns, with the associated entablature stepped in at the angles. The low stage above is octagonal, with alternating louvred vents and recessed panels, and the octagonal spire has recessed faces. 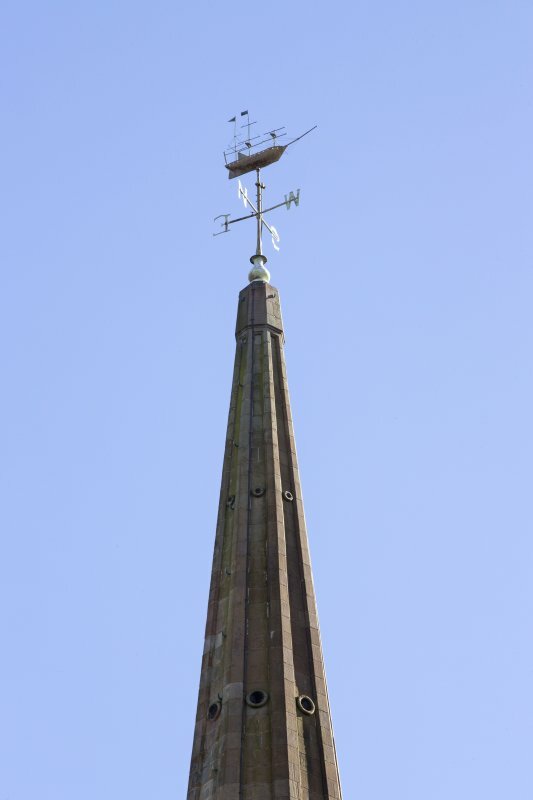 It carries a weather-vane in the form of a three-masted ship. 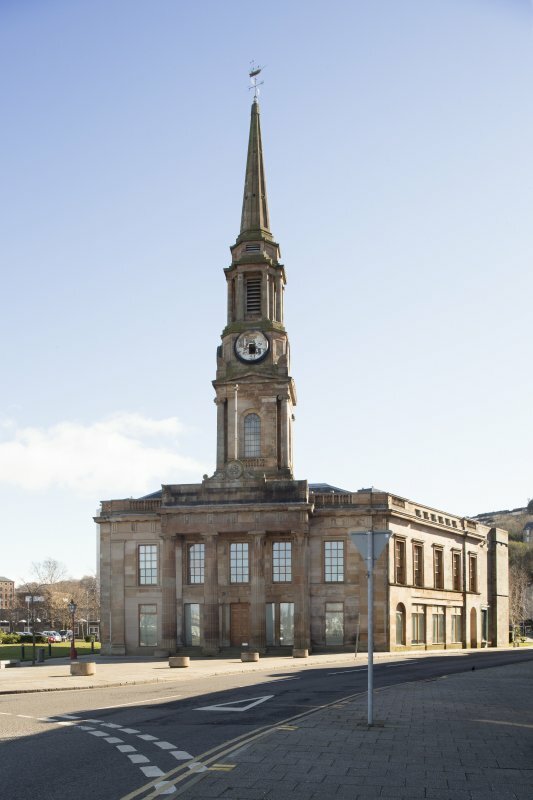 The interior of the ground floor has been extensively altered, with much of the NW wing recast as offices and the main stair, which occupies the steeple, rebuilt in the 20th century. It is reached by a vestibule passage which has a segmental barrel-vault. The E block, as remodelled in 1891 (infra), houses a range of prison-cells entered from a corridor. The cells were originally on the first floor, with jailer's accommodation below. The first floor has also undergone 20th-century alterations, most extensively in the SE block. 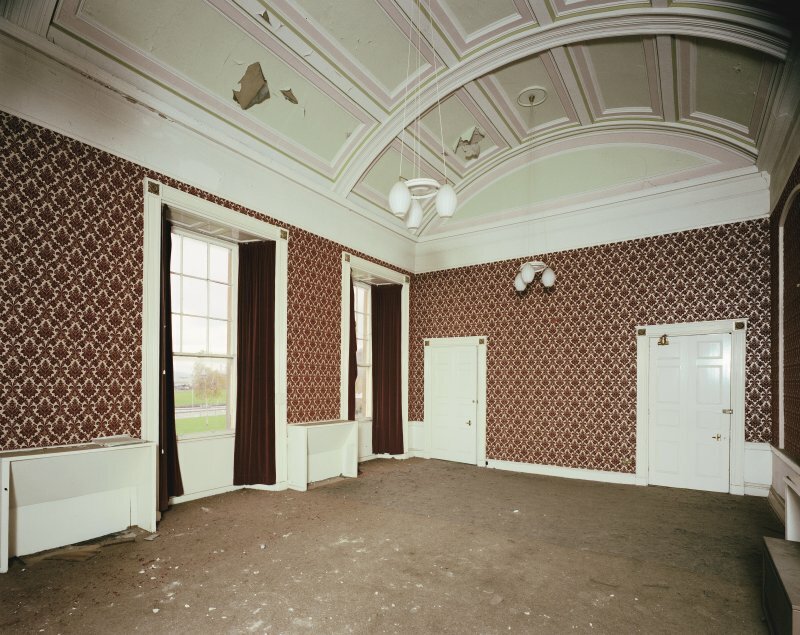 The principal room, in the NE angle, has a coffered segmental vault and reeded door- and window-architraves, but its fireplaces have been removed. An unaltered groin-vaulted document-store with an inner door of cast iron is set in the N front above the entrance-vestibule. 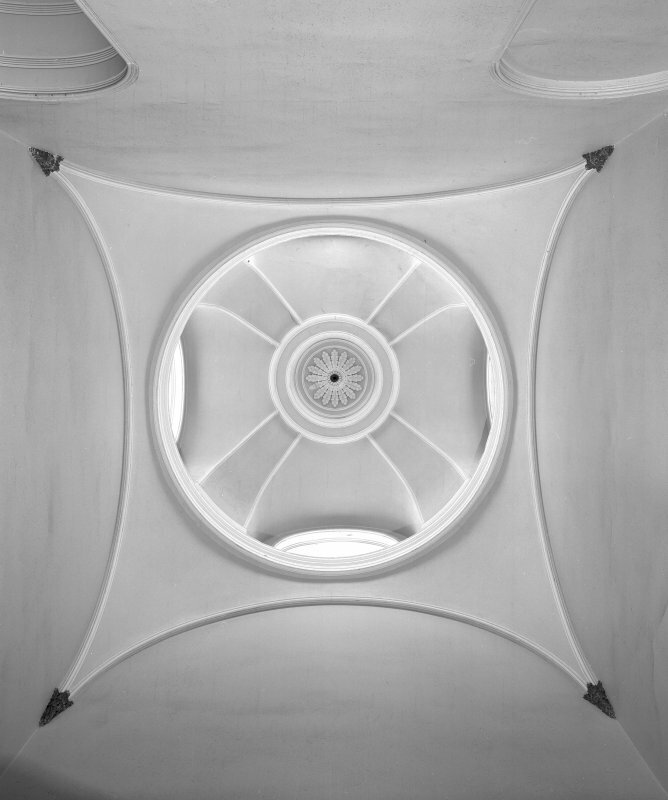 The second floor, which contains a series of small offices, retains few early features except for the cupola over the main staircase, which is a massive cross-ribbed structure lit by four round-headed openings and having a foliated centrepiece. 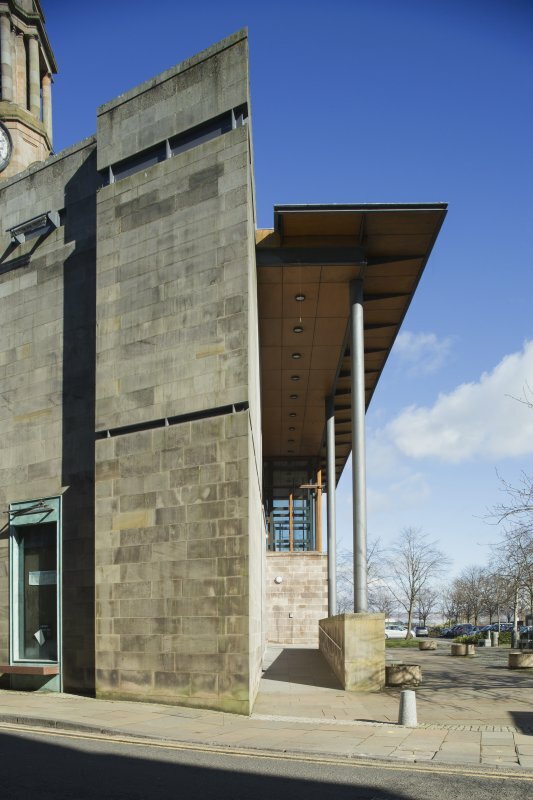 The second stage of the access-stair to the steeple comprises a timber spiral stair enclosed in a slatted wooden cylindrical cage. 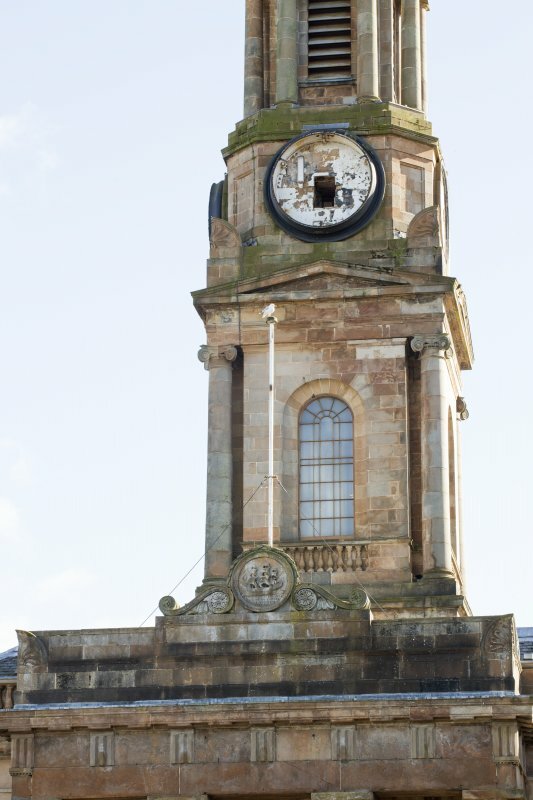 The clock-mechanism is undated and the existing bell, 1.12m in diameter, was cast by James Duff and Sons, Greenock, in 1879. 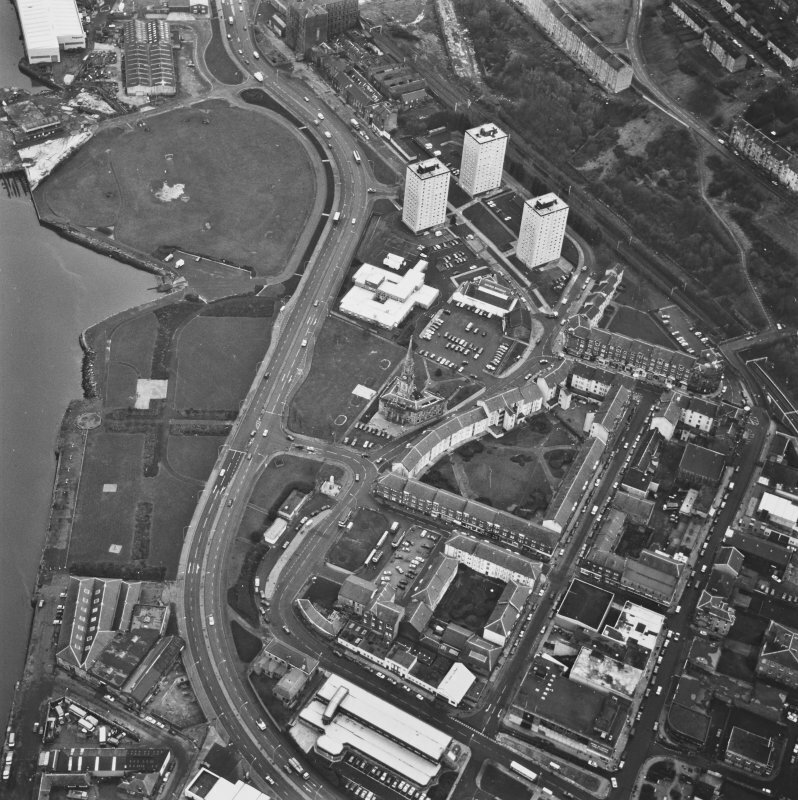 As early as 1668 the magistrates of Glasgow were granted a free port at Newark, with power 'to erect and build bulwarks, As also ane tolbuith or wardeing place upon any parte of the saids lands'. 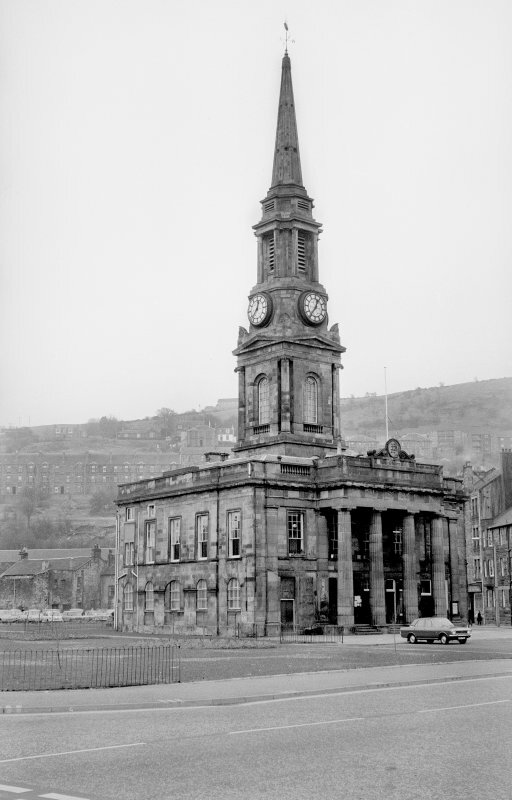 In 1803 the old town hall was found to be inadequate and an Act of Parliament was obtained to allow for new public buildings. 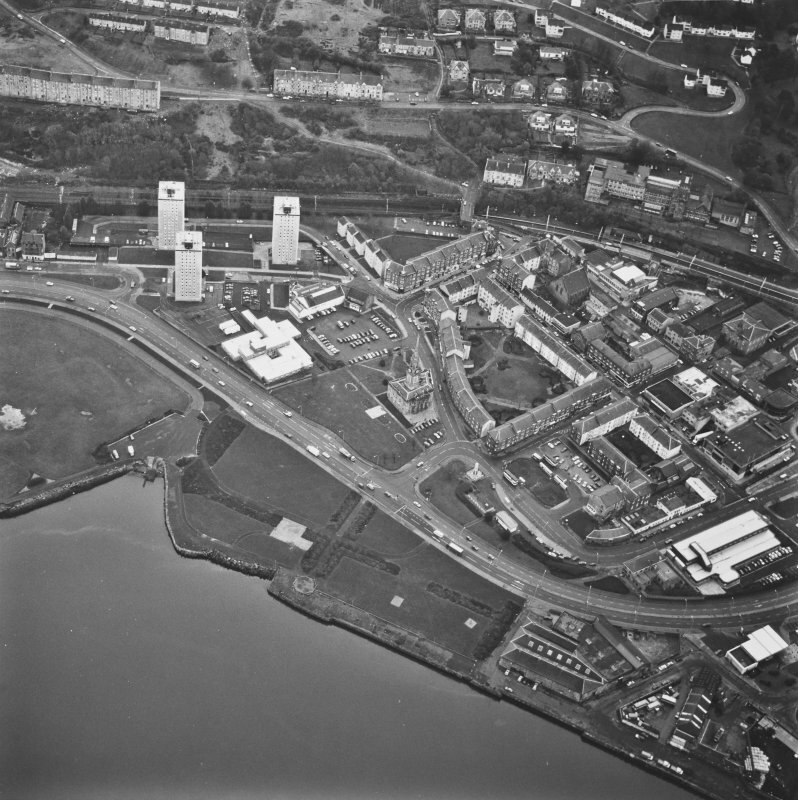 A Mr Wood was requested to 'prepare a plan of the proposed Prison, Council Chamber and other publick buildings to be set down on the Breast', but it was to be ten years before work began in earnest. 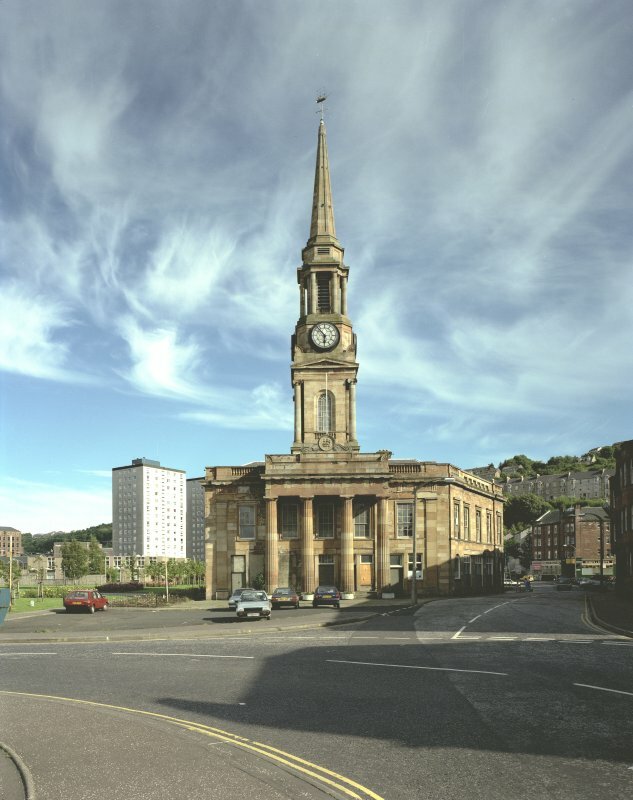 New plans were obtained in 1813 from William Burn and David Hamilton, those by Hamilton being chosen while Burn, after insistent demands, was paid £100. 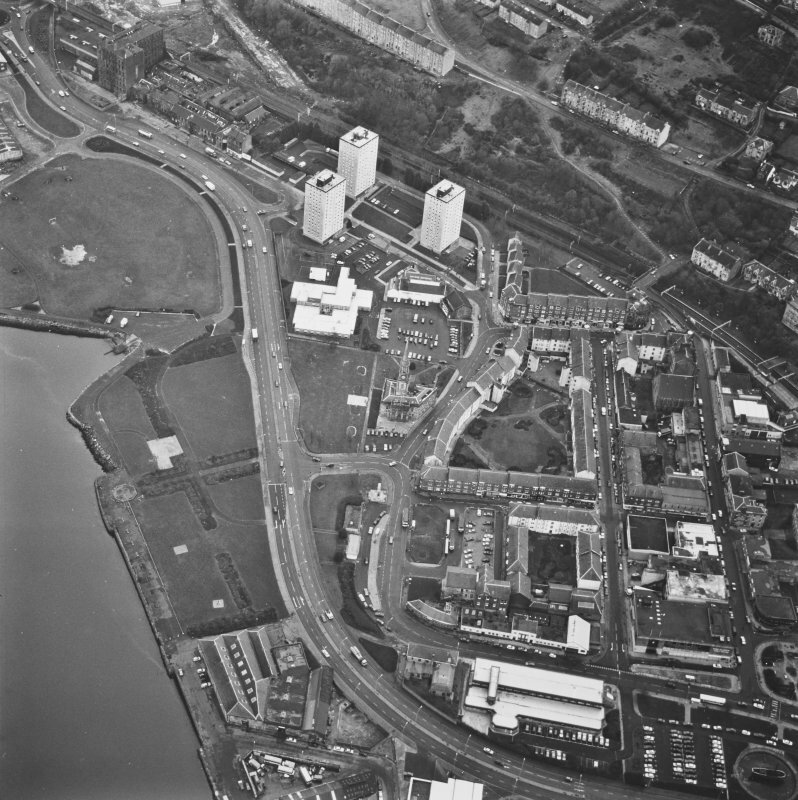 Local contractors were employed, John Robb of lohnstone being responsible for mason-work and Roderick Young of Port Glasgow for wrightwork. 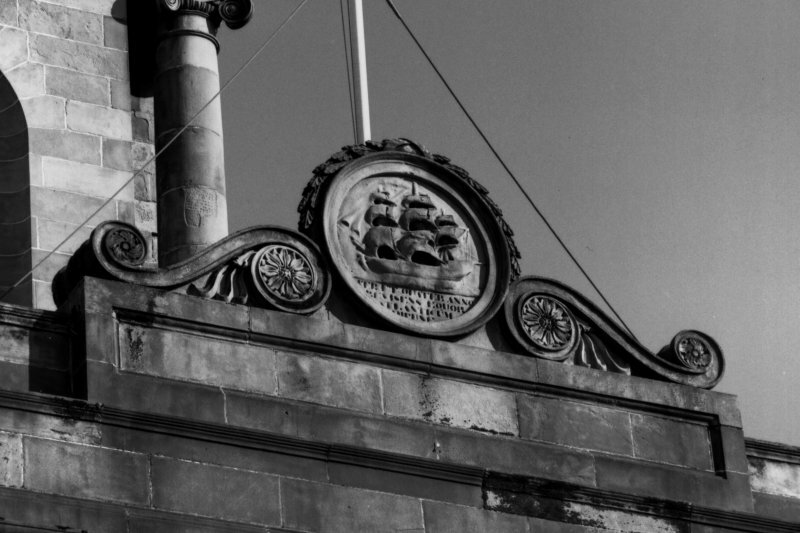 When completed, at the end of 1816, the total cost of the new building was £12,000, funded mainly by bonds and public subscription. The building underwent alterations in 1860-2, but required further repairs under the supervision of J T Rochead in 1862, after damage by lightning. 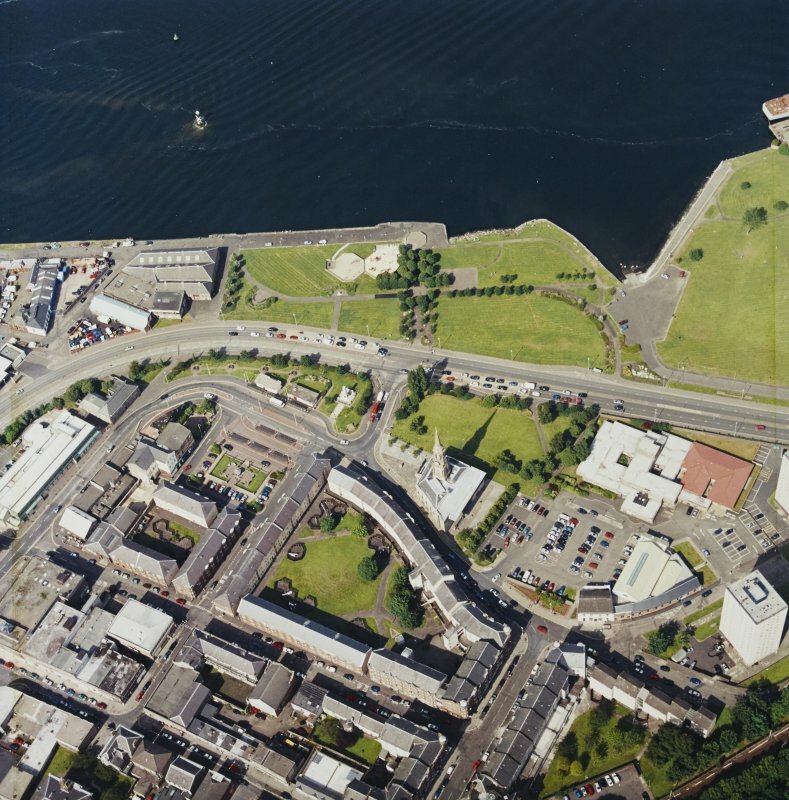 Further alterations to the police cells were carried out in 1883-4,12 and the prison accommodation was remodelled in 1891 , to designs by J B Stewart of Greenock, after a government committee had condemned it as 'insufficient'. 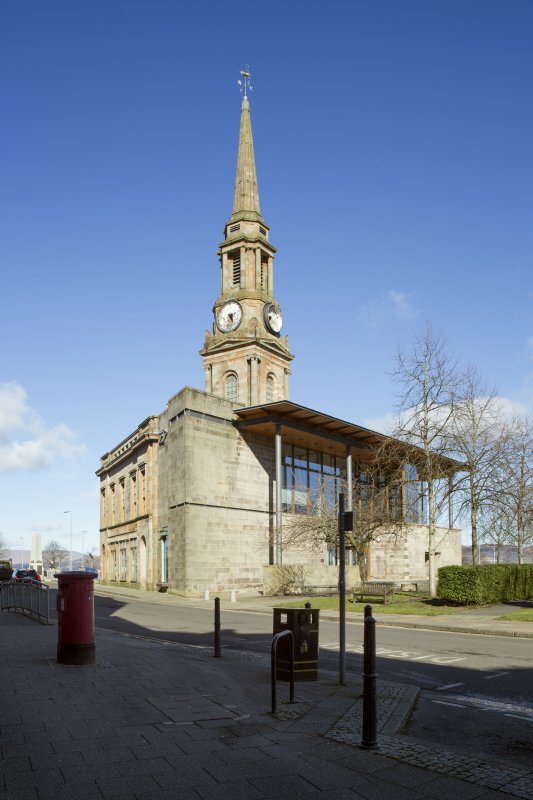 Although a new town hall was built in 1868-70, the building remained in use for local government purposes.